I decided on a few key things leading up to today. First, I was going to use a basic vegetable stock made from onions, carrots, and celery. Second, I would blanch the frozen peas in the broth to add even more flavour to the broth. Lastly, I was going to add prosciutto for a salty element to the dish. Cut up one large white onion into 1/8 portions. Cut the celery and carrots in similar sized pieces. In a pot, add in a little olive oil. Add in the vegetables and cook until the edges brown. Add water to the pot and bring it to a boil. Once water is boiling, lower the heat to a simmer and leave for at least an hour. Take a cup of the frozen green peas and blanch in the hot stock. Once cooked, transfer the peas to a blender and add a bit of the stock to help in blending. Season with a bit of salt. Process the peas until smooth then sift through a screen to remove the skins and come up with a smooth puree. Blanch a quarter cup of the frozen peas in the stock. Transfer to a bowl and drizzle with some sesame oil. 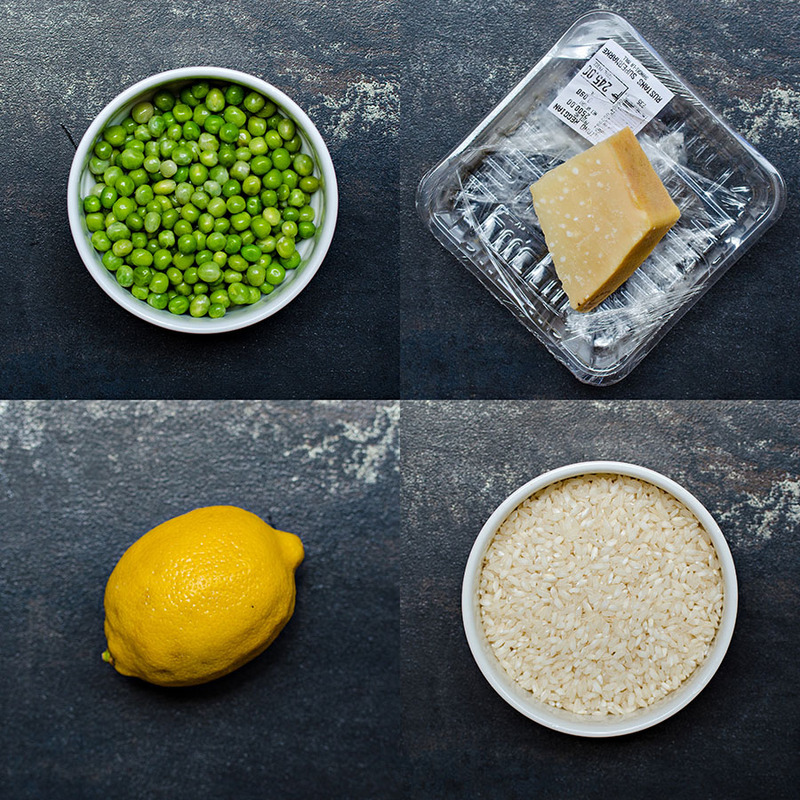 Basic process for the risotto can be found here. The main difference for this will be in the finishing of the dish. Halfway through, I added the rest of the green peas as well as the green pea puree into the rice. I would actually recommend making more of the puree for a more vibrant and fresh green colour. Right at the end, I squeeze in the juice of one lemon along with the butter and parmesan. 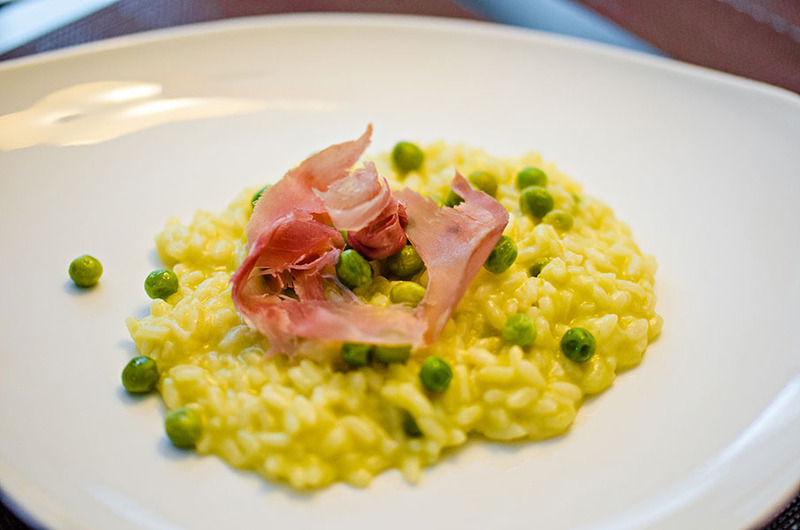 After plating, I tore a few pieces of prosciutto on top of the risotto and topped the whole dish with the sesame oil drizzled green peas for that nutty flavour. The resulting dish is a bit sweet from the peas with some sourness from the lemon juice and some saltiness from the prosciutto. The whole green peas add a little texture while the sesame oil round out the flavours with some nuttiness. This was a very promising alternative to the usual risottos that I make. If ever you are in a pinch (Green peas only cost ~Php 60 for a big bag) but still want to impress, this dish is definitely something you can try out one weekend. Add some grilled meat that’s seasoned simply with just salt and pepper and you have a winning weekend meal already. The risotto and grilled meat also pairs well with a lemon, gin, and sweet vermouth cocktail for a very bright and refreshing meal!